Precious stones attract human for various reasons - extraordinary beauty, beautiful color, mystery and rarity. Thousands of years ago precious stones were hiding in the crevices of rocks and mountains, lying at the bottom of rivers. No one knows how the first man came to realize that gems can be worn over. Luckily, the idea spread out! Gems have exercised their powers over men for millenia - influencing their feelings and imagination throughout the centuries. People have always believed that these unusual creatures of nature are endowed with supernatural powers, which help to protect against diseases, misfortune and bad luck. Since ancient times, gemstones were considered cure for many diseases and ailments. Of course, modern doctors are skeptical of such treatments. But, nevertheless, sometimes there are facts that cannot be denied. Diamonds were always attributed with therapeutic properties. There is a theory that it absorbs and amplifies the thoughts of those who use it, as well as negative qualities of other gems and their owners. In ancient times, the diamond was also used for detoxification, as people believed that it protected them from poisons. 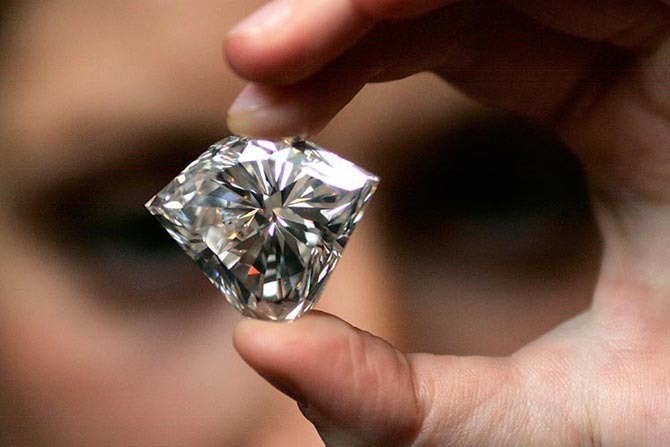 Diamond has always been considered as the winners’ stone. It served as the mascot of Julius Caesar, Napoleon and Louis IV. Diamonds are able to ward off fears, to protect its wearer from various negative influences and bring him good luck. But if the diamond is a symbol of wealth, power, youth and beauty, and timelessness, the diamond can also become a symbol of constancy and love. Honesty, kindness, compassion and commitment - these are the main characteristics of people who prefer to wear this stone. Emerald Written many centuries ago, the Vedas, the holy scriptures of the Hindus, say that emeralds promise good luck and well-being. No wonder the treasure chests of Indian maharajas and maharanis contained wonderful emeralds. Emerald is the official birthstone for May and the official anniversary gemstone for commemorating the 20th and 35th year of marriage. It is worth to buy jewelry with emeralds, if you want to strengthen the family and have children. Also, emeralds calm, give peace of mind and joy. Sapphire is a stone which is famous with its therapeutic qualities. There is a theory that the water in which the stone was located for some time can treat eye diseases. Since ancient times, the sapphire is associated with peace and happiness, helps to contribute a dialogue, insight, intuition, inspiration and help during a prayer. The ancients believed that sapphires can assist them in predicting the future. Pearls are often chosen by open-minded and kind people. Pearls are not gems, but the way in which they accomplish the transformation from a small grain of sand to a fairy bead make them special indeed. People who choose pearls are strong and have hard character. Amethyst is preferred by wise and calm people. With its curative light, purple amethyst extinguishes anxiety and emotional pain, cleanses and soothes the mind, as well as helps control emotions. Amethyst is a love stone. This talisman brings newlyweds peace and happiness for many years. According to popular belief, amethysts give people insight and help to control evil thoughts. Topaz calms bad temper and gives strength to its owner. Topaz improves the purity of thought, increases concentration and confidence. It is also recommended for mood swings, insomnia, anxiety, fear and depression. Of course, these theories about gems’ magical qualities are not proven. However, let’s confess that their main magical power is beauty.